Sumatran seaports are set for an upgrade so Indonesia may capitalise on increased trade traffic in the Malacca Strait. But are Singapore and Malaysia too far ahead? The Ministry of National Development Planning forecasts Indonesia needs an additional 2,650 kilometres of roads, 3,258 kilometres of railways, and 15 more airports. But perhaps most importantly, it says the nation needs 24 new seaports to bolster international trade. The Investment Coordination Board (BKPM) prices these and other infrastructure projects at about Rp.5,519.4 trillion (US$408.4 billion) for the next five years. The Strait of Malacca, an 805-kilometre stretch of sea between Malaysia and Indonesia, is one of the most important shipping routes in the world. This is mainly because it’s the shortest sea link between the Indian Ocean and the South China Sea. Although the Strait of Malacca became Indonesian territory before Susilo Bambang Yudhoyono’s second administration, the Government has not paid much attention to developing or modernising Sumatra’s sea-ports recently. Currently, a substantial two thirds of Indonesia’s trade is handled by Tanjung Priok in North Jakarta, a site which has not been expanded for more than 130 years, despite container traffic growing at a rate of 24 percent annually. Jokowi believes he can solve the problem. In January, the Government broke ground on a new deep-sea port in Medan. The plan is to begin four more ports come October, one of which is the New Priok Port (also known as Kalibaru Port). If successful this would begin operating in 2023 and more than triple the annual capacity of Tanjung Priok. The World Bank says the average dwell time (the number of days a container can stay at a terminal once it has been unloaded before getting slapped with a storage fee) at Tanjung Priok was 6.4 days in 2013. This has dropped slightly since then, but is still an eternity when compared to Singapore: lightning-fast at less than a day. Reducing port dwell time in Indonesia is critical because the longer the dwell time, the higher the costs for logistics and inventory. As it stands, these costs currently make up a whopping 30 percent of total container traffic expenses within the archipelago. Since the 2008 global financial crisis, the number of trade ships coming through the Strait of Malacca has steadily increased. In 2014, transits hit an all-time high at around 79,000 with a daily average of 217 ves-sels. Through the Master Plan for Acceleration and Expansion of Indonesian Economic Development (MP3EI), the Government intends to increase island connectivity while also capturing lucrative opportuni-ties in the Strait by speeding up seaport development in Sumatra. One notable project is the Kuala Tanjung seaport, which is operated by three state-owned companies: PT Pelindo I, PT Waskita Karya, and PT Pembangunan Perumahan. To realise its vision, Indonesia must indeed catch up with Singapore and Malaysia, two countries that are already ahead of the game in terms of maritime trade sophistication. Data from the Transportation Ministry suggests the Port of Singapore, which handled 31.26 million TEUs in 2012, is the second biggest port in the world, after the Port of Shanghai. Despite already acting as a well-established trading spot, another major terminal expansion project is already underway in Singapore. Malaysia is expanding Port Klang, which is currently the world’s 12th largest port by volume and the 17th busiest port in total cargo tonnage, according to recent statistics from the World Shipping Council. In March 2015, Malaysian Prime Minister Najib Razak said about 300 million Malaysian Ringgit would be spent to improve the port’s access road, rail network, and traffic management system. When asked if it was truly feasible for Indonesia to enter the same league as its closest neighbours, Mama-hit says he remains optimistic so long as traffic stays high in the Strait and the plan is executed according to its target timeline. In Singapore and Malaysia, around 80 percent of total maritime traffic is derived from trading. “There is a high probability that we can capture 80 percent of transit traffic from Singapore and Malaysia because businessmen tend to use ports that have goods supply and cargo bases, which will be provided in the up-coming Kuala Tanjung port,” says Siagian boldly. Optimists like Siagian believe the integration with industrial areas will bring multilayer effects, not only for multinational companies, but also to small and medium-sized businesses. “Currently, local businesses still export raw commodities, and by creating [refineries] and other processing industries inside the port areas, we seek to add value to our commodities, such as crude palm oil, rubber, and aluminium. This can increase Indonesia’s export value and create employment for many,” he suggests. When considering the possible economic benefits of building out Sumatra’s seaports, it’s no surprise the regional government strongly supports the effort. Foreign investors like Port of Tianjin; China Harbour; China Communication Construction Company, Port of Rotterdam, and Marubeni Corporation, have also expressed interest. However, a foreign investor has yet to be locked in, and Jokowi is reportedly still doing a roadshow in other countries to attract potential investors. Locally, the three largest state banks, Bank Rakyat Indonesia (BRI), Bank Mandiri, and Bank Negara Indone-sia (BNI), have signed loan deals with Pelindo worth Rp.5.05 trillion (more than US$360 million) in total. The archipelago’s move is welcomed warmly on behalf of bilateral trade partners; a major player being the United States. Jim Carouso, US Department of State Director of Maritime Southeast Asia Affairs, recently told the media of the implications a seaport expansion would have for US-Indonesia trade relations. He said, “Not only…in Sumatra, but the minute seaports become more efficient, people can trade more cheaply. Clearly, American people can buy goods from Indonesia at a better price. So, I think when infra-structure is improved, bilateral trade will also be improved and investment will increase.” Carouso also voiced admiration for Jokowi aiming to take advantage of Indonesia’s geographic position to become more important for global trading. However, the effects of the plan remain to be seen, and some experts doubt Indonesia can make good on its promise to pull off a massive infrastructure overhaul like the one proposed. It’s no secret the archipel-ago is a hotbed for embezzlement, and ports are particularly difficult to monitor. 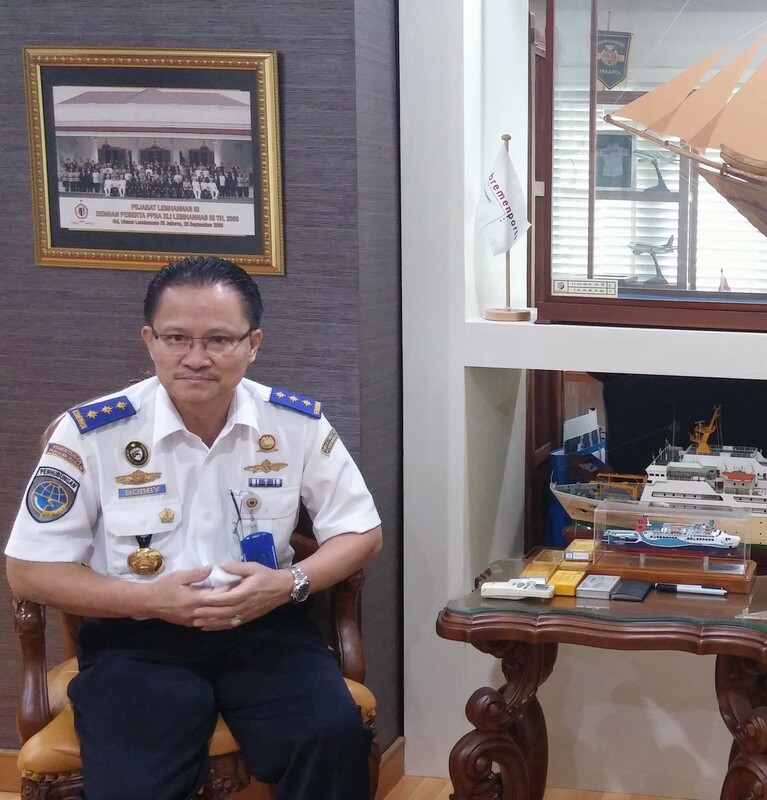 In July, the Jakarta police announced they would detain the Trade Ministry’s head of subdirectory non-imported capital goods Imam Aryanta as a suspect in a corruption and money laundering scandal at Tanjung Priok.